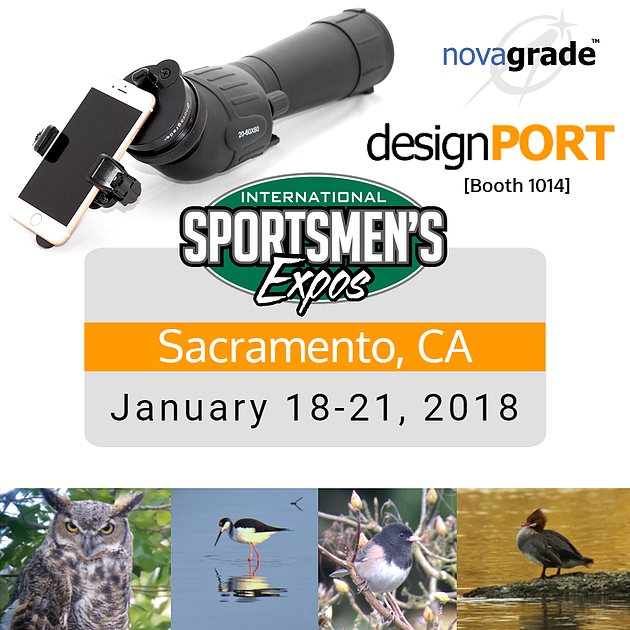 DesignPORT and Novagrade® will be exhibiting at the Sacramento International Sportsmen’s Expo tomorrow January 18-21, at BOOTH 1014. We created a universal adapter that could couple any phone to any spotting scope or binoculars, allowing the user to take stunning telephoto pictures. In fact, it’s the highest quality universal digiscoping adapter on the market. Not only does it accept any phone, in or out of a case, it also fits on any round eyepiece. It’s design is ideal for guides and professionals looking for lifetime construction. Anodized machined aluminum body, laser etched logo, and a patent pending compression ring system are the reason the Novagrade® brand is a worldwide success. Check out the Novagrade Digiscoping Adapters in action! We would love to speak to you in person about the universal adapter we designed and how we can help you bring your next idea to life. We are up for any challenge!